ZaZa's first quarter 2014 average combined production in the Eagle Ford (South Texas) and Eaglebine (East Texas) was 630 boe/d. 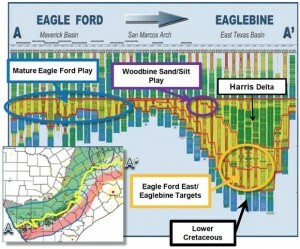 The company has re-focused its attention to the Eaglebine, after divesting 10,300 net Eagle Ford acres in July of 2013 to a subsidiary of Sanchez Energy for $28.8 million. Approximately 82% of ZaZa's first quarter production came from the Eaglebine. During the first-quarter, the company continued to position itself for growth across its portfolio. In May of 2014, ZaZa announced that its CEO, Todd Brooks, will be taking a salary of $1 dollar for the next two years. During that time frame, Brooks' compensation will consist of equity grants or other equity-related compensation. ZaZa Energy is currently operating at a net loss of $1.4 million, compared to $2.9 million last year at this time. During the quarter, one of ZaZa's joint venture partners, Sabine South Texas LLC, completed its commitments to drill two horizontal wells in ZaZa's Sweet Home Prospect. The first commitment well was completed on February 14th and the second on March 11th. Sabine has now been assigned a 75% interest in 7600 net acres in the Sweet Home Prospect, and a well that ZaZa refers to as the "Boening well." Participating interests in any additional drilling or acquired lease acreage in the Sweet Home Prospect will be shared 75% by Sabine and 25% by ZaZa under an area of mutual interest agreement (AMI) that will expire during the third quarter. ZaZa entered into a further amendment of its joint venture with EOG Resources in the Eaglebine during the first quarter. Under the ammendment, ZaZa will receive ~$14 million and a two-well drilling commitment from EOG. As part of the agreement, EOG must begin drilling the first of two wells by July 1, 2014. In exchange, EOG will gain a 75% working interest in all of Zaza’s remaining acreage (9,600 net acres). During the quarter, ZaZa acquired 5,000 net acres in Houston County and Southeastern Leon County in its core East Texas area. This acreage is currently held 100% by ZaZa.